· Freshly burned landscapes in San Diego from any of the previous fires. · Pictures of wildfires, including embers falling, trees burning, and the like (pictures of burning palms, eucalypts, and nonnative pines are welcome). 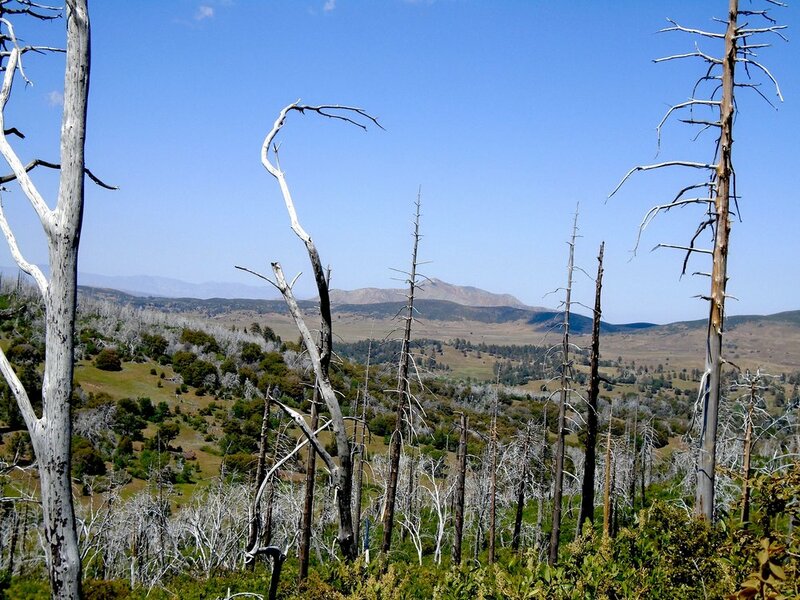 · Regrowth of woody plants following the fire. · Fire followers (individual plants blooming in a burned landscape, fire-follower species, landscapes of wildflowers with burned stumps poking up). · Pictures of burned trees, especially oaks. They can be singed, dead, and/or resprouting. · Fire burned snags, especially if they’ve been repurposed by wildlife (as for a woodpecker granary). · Weeds invading a burned area. · Landscapes showing the differences in plant composition of areas that burned at different times. · Wildlife tracks in ash. · Pictures illustrating the following vegetation types: grassland, coastal sage scrub, chaparral, oak woodland, montane conifers, woody riparian. · Pictures of leaves and acorns for our local oak species. · Time sequences of areas right after a fire, one year, two years, three years, or longer. · Erosion control structures, wattles, straw, etc. · Roots stabilizing burned hillsides. · Fire resistant home features. If you have images you want to share, contact me at conservation@cnpssd.org, and let’s talk. I won’t promise to use everything, as the original only used 68 images, but I would like to see what you want to show. One of the differences will be a larger section on preparing for the next wildfire, something that got a scant two pages in the first document. Why expand that section? If you have read the County’s official Ready, Set, Go! Your Personal Wildland Fire Action Guide (freely available as a pdf), you may not be asking that question, but perhaps you haven’t read it. I have. To be fair and to honor their work, I agree with most of it, but not with the way it’s presented. My biggest disagreement with them is over what they tell people to do when they evacuate. Ready, Set, Go! makes some assumptions. One, which I agree wholeheartedly with, is that most people don’t want to prepare for fire. This is a topic I’ll get back to later, but I’m not a rabid prepper, and my wonderful wife is even less interested. Her point is valid: why should we rebuild our home to deal with an emergency that may well not even happen while we live there? I’ll return to this issue at the end. The County’s response to this apathy was to ask everyone in San Diego to create a single emergency kit to deal with all emergencies. Theoretically this kit would work equally well for family survival through the major kinds of disasters we have in San Diego: wildfires, earthquakes, flood, and droughts. · Three-day supply of water (one gallon per person per day). · Non-perishable food for all family members and pets (three-day supply). · An extra set of car keys, credit cards and cash or traveler’s checks. · Extra eyeglasses or contact lenses. · Important family documents and contact numbers. · Map marked with evacuation routes. · Prescriptions or special medications. · Family photos, valuable and other irreplaceable items that are easy to carry. · Personal computers, hard drives, disks and chargers for electronic communication devices. So if there’s a wildfire raining embers down on you, you’ve finally managed to drive home from work, and you’ve got 10 minutes to evacuate your kids, pets, and household, the first thing they want you to do is lug 100 pounds of water to the car (that’s 12 gallons for a family of four, at 8.35 pounds per gallon), followed by food, first aid kit, flashlight, radio…And no clothes. Or pets. Or cell phone. Would you use the Ready, Set, Go list? I wouldn’t. Earthquakes and wildfires are very different disasters, and you need to prepare for them differently. My earthquake food and water cache is not going in the car if I evacuate for a wildfire. I’ve drafted an evacuation checklist that’s rather different. It’s based on other evacuation lists, as well as personal experience and shared stories. And a number of people are going to read it skeptically before it gets published as our suggestion for evacuation. But should you prepare at all? The short answer is yes, but do it rationally. Even Pepperdine University, that paragon of shelter-in-place preparedness, only burns on average once every five years. That means that there’s an over 1800 to 1 chance that the campus will not experience a fire on a given day (that’s 365 days X 5 years). Due to its location and the fact that it can’t possibly evacuate a couple of thousand students fast enough, it makes total sense that they prepare. But if your home is only likely to burn once every 50 years, does it make sense to rebuild it as a fireproof bunker? You’re likely to be dead before embers rain on your home. Or not. Wildfires are terrifyingly random in their timing, if not in where they burn. We can predict rather better where homes will burn than precisely when they will burn. Worse, the probability of drought and late season wildfires will likely increase with climate change, so we have no idea what the actual risks are. It pays to err on the side of safety, at least somewhat. This is why I’ve prepared a personal evacuation list and persuaded my wife to do likewise. The point about evacuation preparation is that it’s the minimal effort you can do. If you do all the things you’re supposed to do to prepare for any emergency (make off-site copies of your critical documents, back up your electronic files, make an evacuation list, bring your house up to code, clear dangerously flammable stuff away from your house) you won’t make your home fireproof, but you do give yourself a really good likelihood of surviving, with a decent chance of not losing hundreds of thousands of dollars when your home burns down and your insurance fails to cover your losses. It’s about risk management, not disaster-proofing, and the modest things you have to do to prepare to evacuate feel like they’re on par with the low likelihood of having your home burn down. Of course, if you want to, you can remodel your home to be highly fire resistant, landscape your property to snuff embers, install those under-eave sprinklers, get yourself some firefighting gear and training, and prepare to go mano a mano with the next wildfire. But I bet most people won’t do that, and there are 88,000-odd people living in high fire areas in San Diego. The trick is to get them to do something, so that they won’t be caught unprepared. That’s what I’d like us to help do with our version of the CNPS guide. Want to help?